It’s miraculous how just one photo can cause such a ruckus. 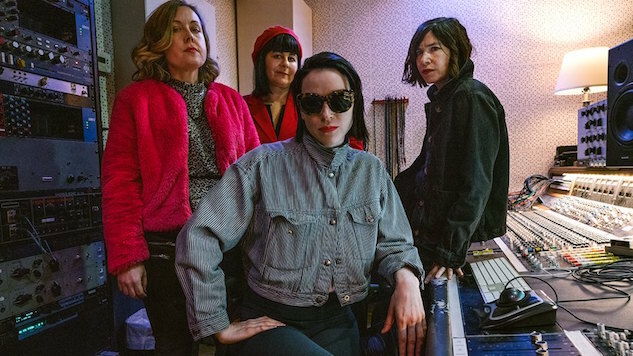 The image to which we’re referring is, of course, the one Sleater-Kinney posted to their Facebook page this morning announcing their next album, which is—wait for it—being produced by St. Vincent. And that’s pretty much all the information we have right now, as the caption simply reads, “Sleater-Kinney. Produced by St. Vincent. 2019.” St. Vincent also shared the news on her socials, with a slightly repositioned photograph. We can’t wait to learn more. The project, to which frontwoman Carrie Brownstein first alluded in a January 2018 interview, will follow Sleater-Kinney’s 2015 album, No Cities to Love, and a 2017 live album recorded in Paris. St. Vincent’s most recent album was last year’s MassEducation, a stripped-down reimagining of 2017’s MASSEDUCTION as piano ballads. It seems St. Vincent’s Annie Clark may have been a longtime fan of the riot grrrl rock band: Early last year, she performed an acoustic cover of Sleater-Kinney’s 2005 song “Modern Girl” in a pre-show Instagram video. Watch a 2009 St. Vincent performance in San Francisco circa 2009 from the Paste archives below and stay tuned for more info on Sleater-Kinney’s new album as we have it.